Image: Twitter/@crimeairnetwork A shack fire broke out on Thursday afternoon in Alexandra, Johannesburg. About 500 shacks have been affected by a fire that broke out in Alexandra, Johannesburg, on Thursday afternoon. An eyewitness told eNCA that the fire started after someone took revenge for an attack on Wednesday. The fire is on the corner of London Road and 18th Avenue. No deaths have been reported. Residents were carrying buckets of water to battle the blaze. The eyewitness said when fire engines arrived there was no water. 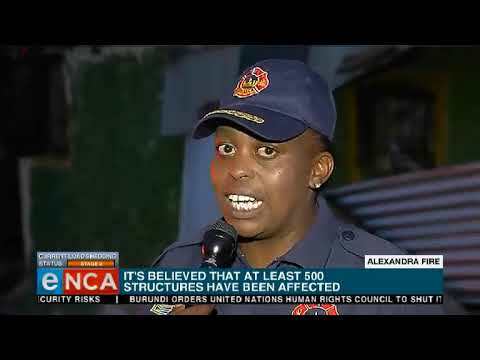 Johannesberg Emergency Medical Services spokesperson Nana Radebe told eNCA they were struggling to fight the fire because there were not enough fire hydrants and that the water pressure was too weak. “We don’t have hydrants in this area … Some of the areas around here were factories, so the hydrants were here. But you’d find that they [residents] have built on top of the hydrants and the hydrants that are close by to the squatter camp have been used,” Radebe said. Radebe said anyone who wanted to help could drop off food and clothes at the Alex and Sandton fire stations. Michael Sun, the city's MMC for Public Safety, said that, as of Wednesday, the city had a fleet of 19 fire engines running and spread across the City's current 28 fire stations. "This number will fluctuate, as some engines go in for repairs or maintenance," he said. A tender to supply more vehicles was halted when the DA took over the municipality in 2017, owing to suspected corruption. Sun said that the DA "discovered issues with the contract which necessitated swift action". "The City managed to salvage seven fire engines from that problematic contract (five brand new, and two newly refurbished), before terminating the contract. Subsequently, we went out with a tender notice, which has now been closed. This is now with our bid evaluation committee," he said. Sun added that he hoped the tender could be awarded by "late January or early February". "Over the next three years, the City of Johannesburg will be purchasing 104 new fire engines, with the first batch being 29. We’re hoping every fire station within the City will receive a new fire engine. Editor's note: This story was updated on Friday, December 7 2018, to reflect Sun's comments.